According to conventional wisdom, things that need to move efficiently through air or water should be sleek and streamlined. Dolphins, jets and speed skaters stick to this rule, but humpback whales, with their massive knobby-edged flippers, buck the trend. 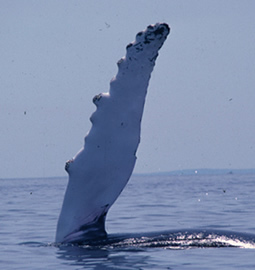 Flipper bumps, called tubercles, are unique to humpbacks. For decades, scientists thought tubercles were a hydrodynamic anomaly until biologist Frank Fish, from West Chester University in Pennsylvania, stuck a four-meter-long flipper collected from a deceased beached whale in a wind tunnel and discovered humpbacks are on to something: The flipper was amazingly aerodynamic. Humpbacks are the most maneuverable of the large whales, says Fish. Their spectacular breeches make them a favorite among whale watchers and their bulk-defying underwater agility enables them to catch bigger, faster prey than other whales. It turns out their funny bumps are the key to the 30- ton whale’s acrobatics skills, Fish and colleagues say in their paper published May 6 in the journal Integrative and Comparative Biology. 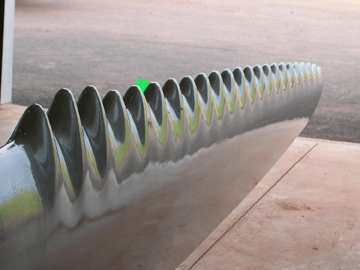 The tubercles channel water over the flipper in such a way as to prevent stall — the loss of forward movement — which allows the whales to turn deftly and move efficiently underwater, says Fish. Humpback whales flout conventional streamlined hydrodynamics by sporting anywhere from nine to eleven tubercle bumps along the front edge of their flippers.